Once you see Lake Tahoe and the Sierras from atop Tinker Knob at 8900+ feet, your view of the landscape will be permanently altered. 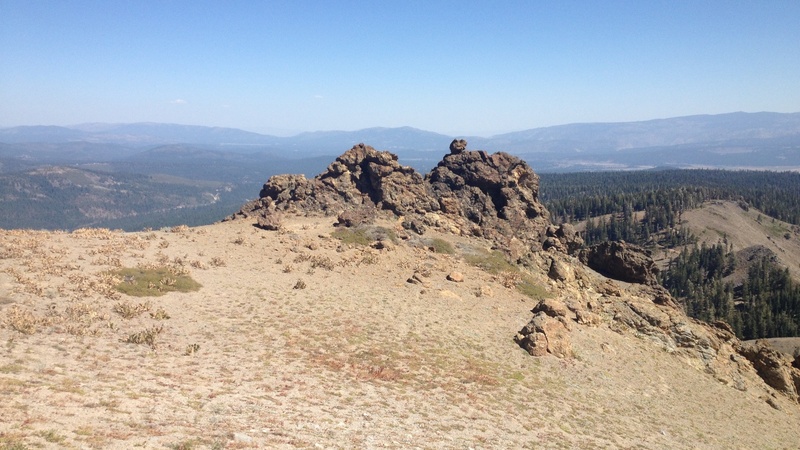 Tinker Knob is prominently visible from Truckee ~ your eye follows Anderson Peak south across the ridge to the distinctive Knob. I frequently find my gaze drawn to the sky as I wonder when I will next have the opportunity to run that ridge and renew my spirit. This 15-mile (total) out-and-back route takes you on the Pacific Crest Trail (PCT) from Sugar Bowl to the top of Tinker Knob, for total elevation gain of about 2600 feet. I like this alternative to the popular Sugar Bowl to Squaw Valley route as it does not require a car shuttle and still grants you the best views from the ridge and the summit of Tinker Knob. 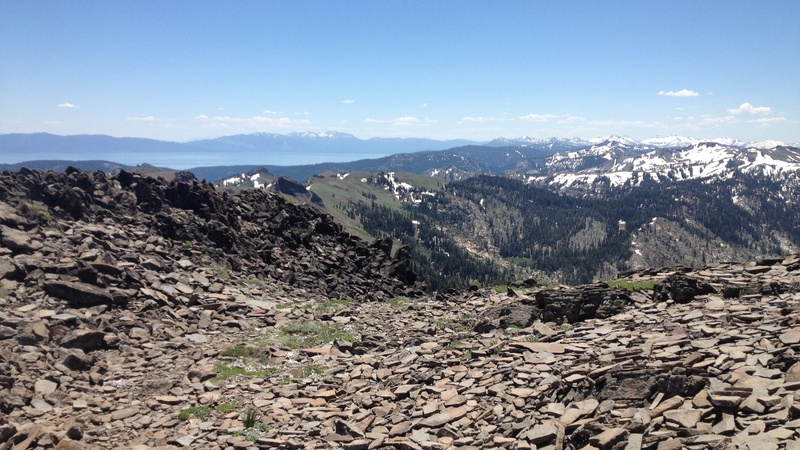 Panoramic views of the Sierras, including Castle Peak, Devil’s Peak, Martis Peak, Desolation Wilderness, Truckee, and more. From the west end of Donner Lake, go 3 miles west up old US 40 (Donner Pass Road). Turn left into the driveway opposite the “Historic Donner Summit” sign. Proceed through the parking lot and down the road less than 1/4 mile to the PCT trailhead. Click here for an interactive map and GPS data for the Tinker Knob (Sugar Bowl / PCT) route. Head south on the PCT from the trailhead. Stay on the well-established Pacific Crest Trail for 7.25 miles, always keeping right on the PCT single track. You will pass trails for the Judah Loop, Roller Pass, and later the Benson Hut on your left. After 7.25 miles, find a short spur on your right that climbs less than a .25 mile to the top of Tinker Knob. Have a snack and take some pictures, then return the way you came. Add the Judah Loop trail to either your climb or descent. Thanks so much for posting this! I’m on vacation in Truckee and ran this course this morning. It didn’t disappoint (there are some gnarly ankle-breaker sections, eh?). Thanks for leading me there.